Dr. Cantu does a very nice job of surveying the field in his new book, Concussions and Our Kids. I enjoyed reading in his book that he acknowledges the significance of eye movement testing, specifically the King-Devick Saccade Test, as a valuable tool in assessing the impact of concussions. 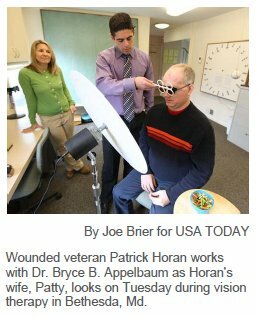 The neuro-ophthalmologists Laura Balcer and Steven Galetta joined the concussion research group at NYU, recruited from UPenn where they had previously teamed with optometrist Steve Devick on a publication about visual components of concussion sequelae. When you have a healthy, bright child with a normal medical history presenting with a pattern of school performance spiraling downward in reading fluency and a recently diagnosed condition of oculomotor dysfunction in visual tracking, you want to have a reasonable explanation…why? We normally think of concussion as related to direct trauma to the head. Increasingly common in sports injuries at younger ages, concussion with significant sequelae has now been widely recognized in college football, even at the high school level and younger. When a person suffers a sudden blow to the head, damage can occur to the brain that results in bruising, shearing and stretching of the neural connections causing what is known as a concussion. Nystagmus refers to abnormal movement of the eyes that is comprised of rhythmic oscillations (moving back and forth) superimposed upon one’s normal eye movements. It can be categorized as either congenital, (which is present at or within the first few months of birth), or acquired, (which has a pathological genesis and is essentially age independent). Studies show an extremely high incidence (greater than 50%) of visual and visual-cognitive disorders in neurologically impaired patients (traumatic brain injury, cerebral vascular accidents, multiple sclerosis etc.). Much more than just eyesight (visual acuity), vision is the process of deriving meaning from what is seen.